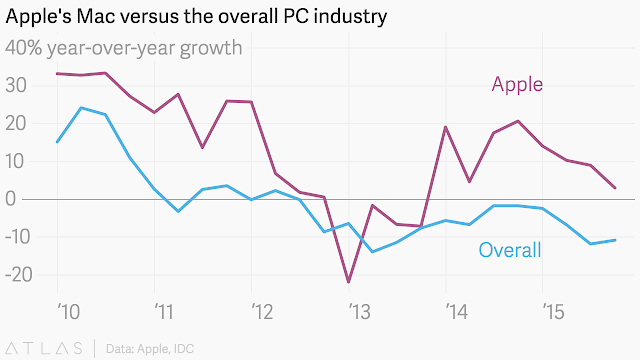 The PC Industry Shrank Another 9%, Gartner Says | Business Insider India: "Gartner released its quarterly PC report and the news isn't good. But it isn't all bad either. 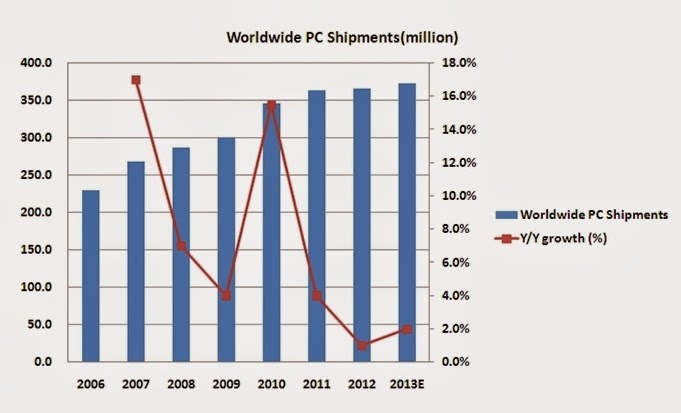 Worldwide, the PC industry declined another 8.6% to 80.3 million units total. That's the lowest number of PC sold in a quarter since the economy crashed in 2008, Gartner analyst Mikako Kitagawa said." Lenovo was still the No. 1 biggest vendor worldwide, with nearly 18% share, a position it took from HP last quarter. 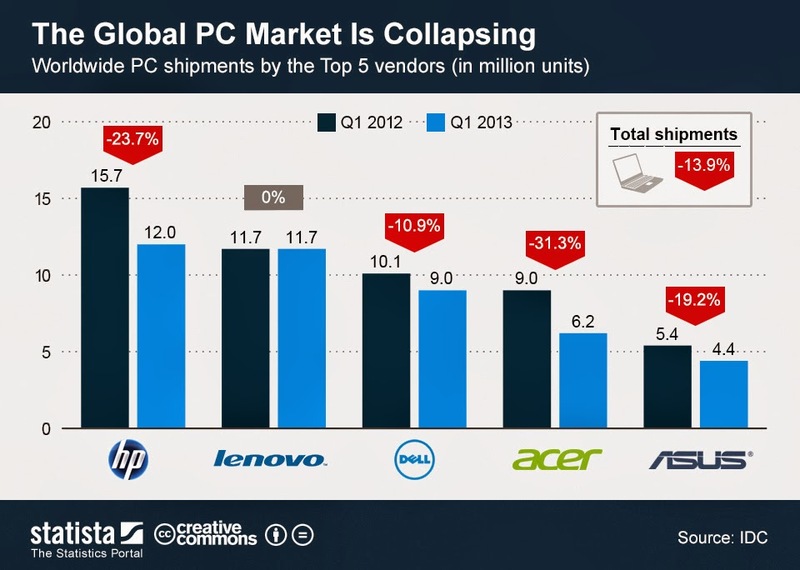 HP had 17% share, Dell had nearly 12%, Acer had 8% and Asus had 6%. Tepid Sales of Microsoft’s Windows 8 Point to Shaky Market - NYTimes.com: If this was in the nineties, any new version of the Windows operating system was enough to get people excited about buying a new computer, giving sales a nice pop. However markets aint' easy as it used to be a decade ago . 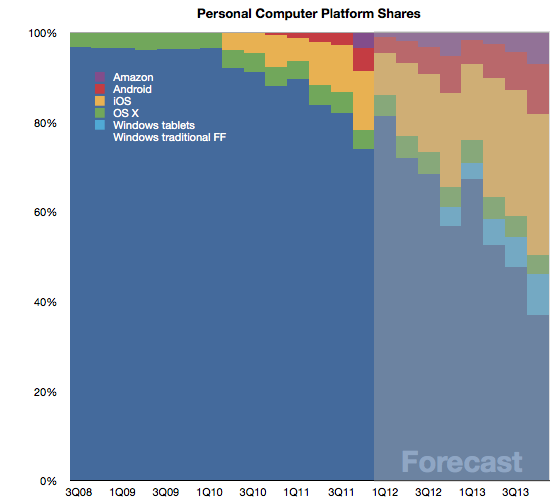 Not now anymore This chart comes from Goldman Sachs, and shows how Microsoft OS losing its market dominance of computing devices as smartphones and tablets have come into the market. As recently as eight years ago, Microsoft had a monopoly on the internet connected computers of the world. Today, not so much.The clearest evidence of Windows 8’s disappointing introduction comes from the research firm NPD, which estimates that sales of Windows machines have actually dropped from a year ago. However Asus and Samsung made progress with their Transformer and Galaxy Tab product lines. 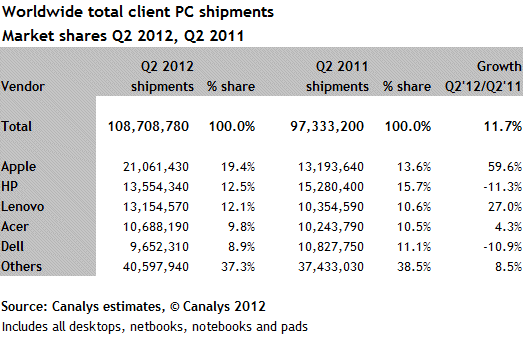 Total ipad shipments increased 75% to 24 million units, representing 22% of all PCs. When would Tablets start showing higher sales than PC ? 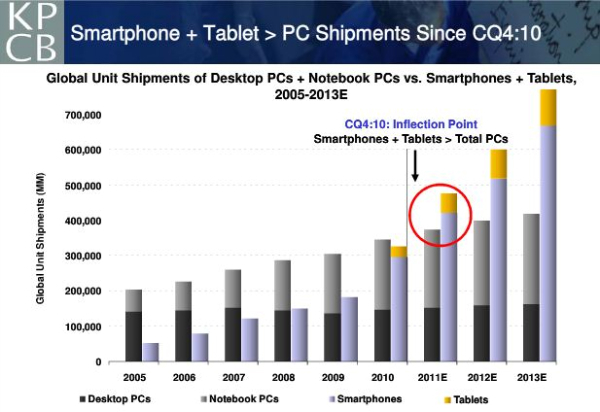 According to Horace Dediu of Symco that day when the tablet market (by units) will exceed that of traditional PCs will come sometime in the fall of 2013. 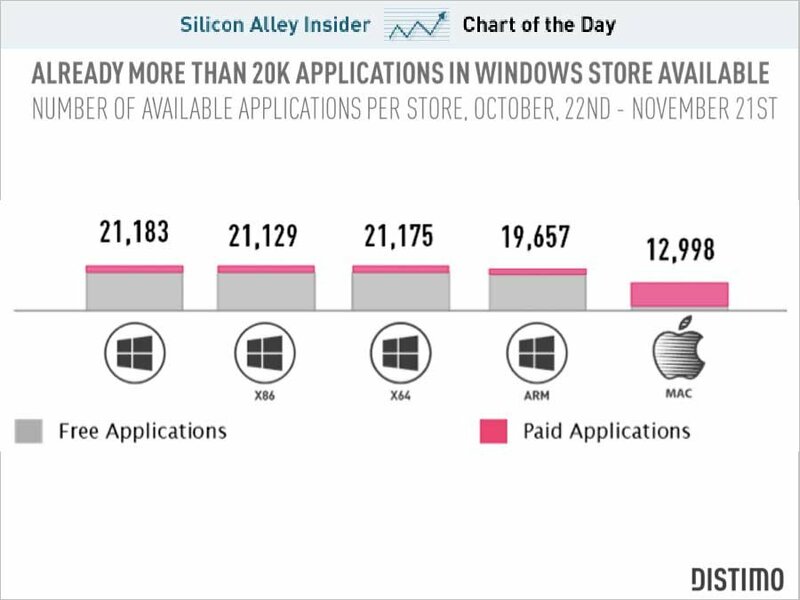 However in order to achieve this by 2012, depends on other factors as well, some of the underlying assumptions are: Mac growth continues at 25% as it has on average for a few years Windows grows slightly in 2012 with the introduction of Windows 8 late in the year. Horace anticipates that Windows 8, including tablet versions, would be mostly upgrades with slow enterprise take-up within this time frame. 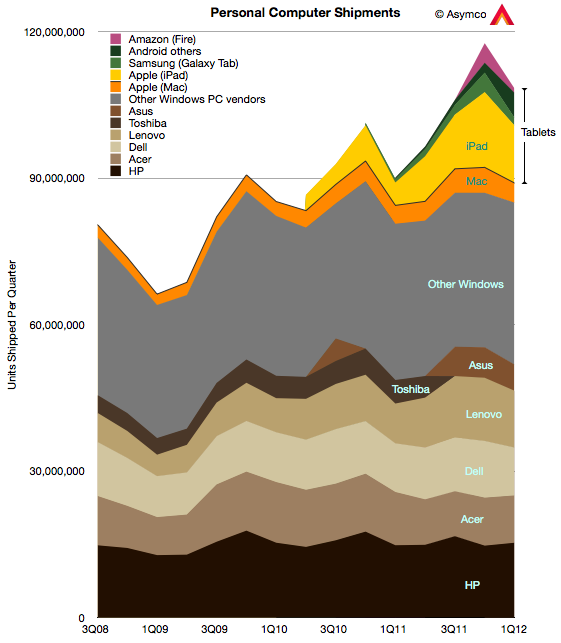 The tablet versions of Windows begin shipping in Q4 2012 with 7% of total Windows shipped. The ratio reaches 20% by end of 2013.
iPad growth will flatten for ’12 and ’13 at 100%, similar to iPhone’s historic performance. 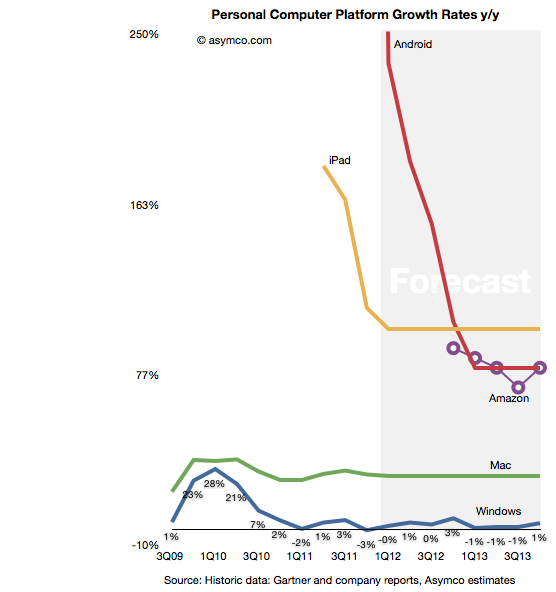 Android tablet growth will be significant in the current year and follow iPad growth pattern though settling at 80% during ’13. 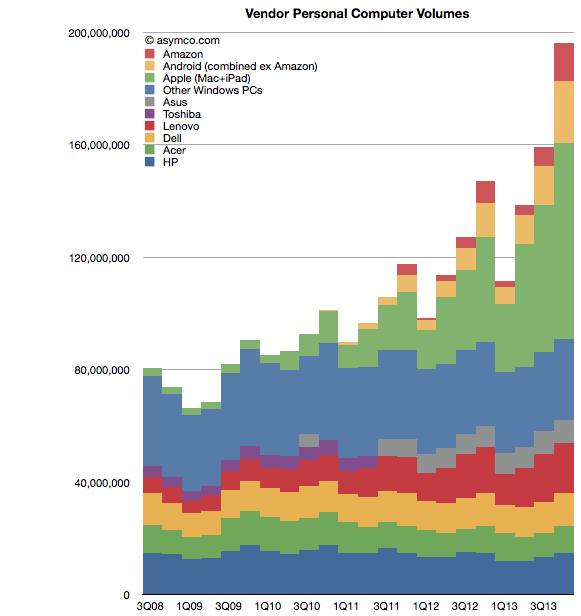 Amazon growth will be approximately 80%.